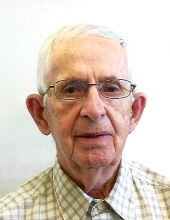 HILTON, JOSEPH E. of Norwood formerly of Roslindale passed away on April 11, 2019 at the age of 84. Beloved husband of Alice F. (O’Laughlin) Hilton for 59 years. Devoted father of Alice A. Stapleton and her husband Jack of West Bridgewater, Carol J. Levitsky and her husband John of North Attleboro and Joseph F. Hilton of Newton. Brother of Joyce Smith of Norwood and her late twin sister Janet McCarron. Cherished grandfather of John, Jessica, Michael, Sara, Hannah and Zachary. Also survived by nieces and nephews. Son of the late Joseph H. and Anna (Walsh) Hilton. Joseph was a member of the Norwood Knights of Columbus, the Retired Men’s Club of Norwood and Brookmeadow Country Club. Joseph was a US Marine Corp Veteran, serving during the Korean War. Funeral from the Kraw-Kornack Funeral Home 1248 Washington St. Norwood, Wednesday, April 17, 2019 at 8am followed by a funeral mass at 9am at St. Catherine of Siena Church Norwood. Visiting hours will be held on Tuesday, April 16, 2019 from 4-8pm. Burial with military honors will be at Highland Cemetery Norwood. In lieu of flowers donations may be made in his name to the Stanley R. Tippett Hospice Home 920 South St. Needham, MA 02492. To plant a tree in memory of Joseph E. Hilton, please visit our Tribute Store. "Email Address" would like to share the life celebration of Joseph E. Hilton. Click on the "link" to go to share a favorite memory or leave a condolence message for the family.